There are parties, then there are Cocoon parties. 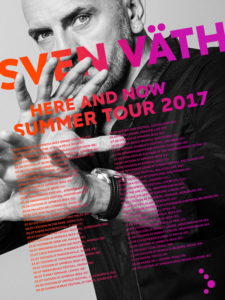 Starting off the 18th season, on the 29th of May, Sven Vath began the musical journey on the magical island of Ibiza for the launch of the most anticipated party of the summer! Taking off at Amnesia (although no one’s forgetting that night anytime soon) partygoers were buzzing with excitement, ready to welcome this sonical phenomena with dancing arms. With phenomenal acts by some revered faces to help him kickstart the scene like DJ Koze opening on the Terrace and Nina Kraviz and Cocoon associates Dorian Paic and Ilario Alicante taking control in the Club Room. With spectacular hoops and a row of fabulous ladies holding up the C-O-C-O-O-N, the night was nothing short of whats expected. 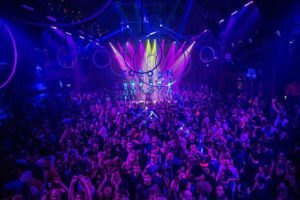 Tracks like ‘Not Also You’ – Henrik Schwarz by Sven Vath and ‘You Can’t Hide From Your Bud’ – DJ Sneak by DJ Koze were dropped on the Terrace pumping people to their fullest. A touch of subtle sentiment was dropped by Ilaria Alacante in the Club Room with ‘Children’ – Robert Miles and finishing off with some hard hitting dance beats, Nina Kraviz brings ‘The Storm’ – Dave Clarke to all those bouncing souls! 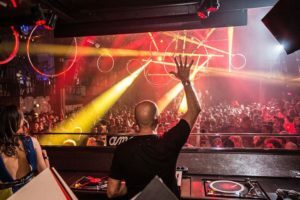 From then to the 3rd of October, every Monday, Cocoon pushes back to the essence of dance music with longer sets, allowing the artists to truly get their teeth into the crowd, taking them on unique, mind boggling journeys. The lineup for 2017 is now out! 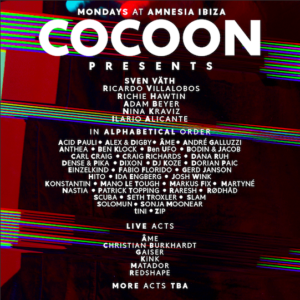 Cocoon regulars like Adam Beyer and Ilario Alicante will be back for seven nights each. Ricardo Villalobos will be on the decks for six events, Richie Hawtin and Nina Kraviz will each have five. Also in store for this 2017, Acid Pauli, Adriatique, Alex & Digby, Âme live, André Galluzzi, Anthea, Ben Klock, Ben UFO, Carl Craig, Christian Burkhardt Live, Craig Richards, Dana Ruh, Dense & Pika, DJ Koze, KiNK live, Dorian Paic, Einzelkind, Fabio Florido, Gerd Janson, Ida Enberg, Josh Wink, Konstantin, Luciano, Mano Le Tough, Markus Fix, Martyné b2b Bodin & Jacob, Nastia, Patrick Topping, Popof, Raresh, Rødhåd, Scuba, Slam, Solomun, Sonja Moonear, tINI and ZIP. Try and catch him at one of these for a finely curated night of pure music!